Zebrafish have been widely used as a model system for studying developmental processes, but in the last decade, they have also emerged as a valuable system for modeling human disease. The development and function of zebrafish organs are strikingly similar to those of humans, and the ease of creating mutant or transgenic fish has facilitated the generation of disease models. Exposure of zebrafish larvae to a common convulsant agent (pentylenetetrazole, PTZ) induced a stereotyped and concentration-dependent sequence of behavioral changes culminating in clonus-like convulsions. Tracking of swimming behavior is easy to implement using our WMicrotracker system. Below you’ll find a procedure example. 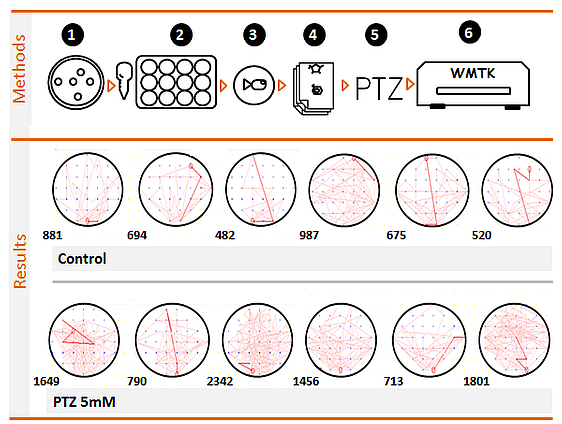 In this experiment we can observe the effect of PTZ on 5 dpf zebrafish larvae behavior after 15 minutes of drug exposure. The plot shows the tracking of swimming behavior and the distance (in mm) for each fish cultured in a 6-well microplate. An increase in the total traveled distance is observed when fishes are treated. (1) Collect fertilized eggs in a petri dish with E3 medium. (2)Pass one 48-hpf non-hatched zebrafish embryo to each well of a 6-well plate. Fill the volume with E3. (3)Incubate 48 h at 28? C to allow hatching. Grow the fishes until 5 dpf. (4)Add a 10x concentrated solution of anticonvulsants to test. Use six technical replicates. (5)Add PTZ to induce convulsions. Recommended doses are 2.5 to 10mM. (6)Register larvae activity using WMicrotracker for a period of 15 minutes. Set “tracking mode”.